Image “Not for Sale” used with permission from the creator Ira Gelb who’s an activist in stopping Human Trafficking but authorized this image for use outside. It’s funny, at various junctures I’ve felt propelled to tackle certain topics, even when that made me very unpopular. My biggest leviathan to date has been this notion of artists being expected to work for free, and I believe the reason that this topic is weighing so heavily on me is that, for the first time in years I’m no longer enthusiastic about our future. In fact, I’m downright frightened, because of THIS. Yesterday morning on my Facebook, a friend shared this open letter to Oprah Winfrey from a local performer in the Bay Area, Revolva, whose act caught the attention of mega-icon Oprah Winfrey. Oprah was holding The Life You Want conference and the producers contacted Revolva to see if she would like to perform as part of a conference featuring mega-stars like Deepak Chopra and Elizabeth Gilbert. At first, Revolva was over the moon. OMG! OPRAH! Sure! How much does it pay? Well, we don’t pay. The artists get exposure. Revolva in an act of unbelievable bravery…said no. She could not work for free when she, herself, was struggling just to make ends meet—especially at an event that was charging $600-$1000 a ticket in an arena that could accommodate 18,000 people. The producer’s response to her asking to be paid? So sorry. All the slots have filled. We’ll contact you at a later date when we hold a conference with a bigger budget. Businesses are always seeking ways to innovate and I applaud them, but with the explosion of the internet and our global society becoming more integrated in the web, the soma of free non-stop entertainment has blinded us to a cancer that’s metastasizing. Artists always have struggled to have people value their work monetarily, but this is different. Very different. And yes, branding and social media are all necessary and vital, but unless we all want to die from being worked to death? We need to pay attention to the symptoms of sickness and DO SOMETHING. The accepted norm in Western civilization for centuries was that the artist owned his or her work (copyright) and thus could choose what way to monetize it. That’s all vanished and we’re facing a monster unlike anything we’ve seen. The reason? Consumers are blind to culture climate change that is creating an environment where disease thrives. Stop Whining. It’s ALL In Your Head! Creatives are struggling to survive, but what makes it worse is we’re facing a life-ending “cancer” but far too many around us believe we are whining or being a hypochondriac. When my blog Pay the Writer took off, I was amazed at the wonderful support. But what amazed me even more was the vitriolic attitude toward me and writers wanting to be paid. Create something people want to pay for or get another job was something I heard more than I liked. I agree! But this performer Revolva illustrates what’s vexing many artists. She created an act that caught the attention of Oprah’s producers. Seemingly her content had some value since the tickets were $1000 a piece. She did create something of value for consumers, but not of value for the venue hosting her act (and profiting from it). Our culture cheers that Oprah is worth almost $2.9 billion dollars and are happy to pay her because, “Well, she creates a product of value.” But that product of value rests largely (at least in the instance I’m referring to) off the voluntary assistance of unpaid professionals—who are told in regular life, “You want to be paid? Offer something of value or get another job!”. Am I the only one seeing the paradox? And I don’t know if folks like Oprah are meaning to treat artists unjustly. I think, like my grandmother offering me a whole dollar do all her yard work, many people have not caught up mentally to this new reality and then changed their ways of dealing with artists. That’s what we are going to look at but today I am trying something new. This post is too short to make a book but too long for a “blog” (just over 3,000 words). The problem is that the concepts, broken apart, lose integrity and I feel we cannot see the big picture which is why I am hesitant to break this into multiple posts published separately. As a solution, I’m trying a different structure and this is my only post this week. I’m breaking this into three acts like a play, since it actually IS our story. It just happens to be a Choose Our Own Ending kind of story. Read all at once or one act at a time. I hope the editing makes it easier to absorb because this is an issue that is seriously impacting ALL of us. At the end of the 1990s and beginning of the 2000s, average people generally were not on a computer outside of work. How we found and consumed entertainment was vastly different. If we wanted music? We bought a CD. Wanted a book? We bought one. Wanted a movie? We had to buy a ticket or a VHS/DVD. Even in secondary sources (libraries, radio, television, rental establishments) artists received some kind of compensation. But then our culture began shifting on-line. Today’s user-based web is an unplanned consequence of the implosion of the dot.coms meeting with a strange confluence of other events. Why was BlackBerry a big deal? Blackberry changed everything because it finally tipped technology from the early adopter into the mainstream. BlackBerry successfully bridged our transition from paper to handheld computer to digital and set the stage for the rise of the smartphone. In 2006-2007, BlackBerrys took off and forever altered our world. For the first time, regular people were using their phones in never before imagined ways (I.e. as a camera). Web 1.0 was the firm domain of the professional contributors because devices were cost prohibitive and one needed an advanced skill set (I.e. HTML) to contribute. But Web 2.0? Web 2.0 was meant to be ruled by regular people. Devices like BlackBerry made it increasingly easy for people to share content (which is a huge part of socializing). Soon people were addicted to consuming and sharing music, videos, pictures, blogs, etc. Social media appeared to accommodate this shift in behavior. MySpace launched in 2003 but hit it big in 2005. YouTube was launched in 2005 and was one of the fastest growing sites in 2006 when it was purchased by Google. Facebook opened up to the general public at the end of 2006. So in this three-year span everything shifted. The web we know today didn’t start getting momentum until I’d say around 2005 and after 2007? It was unstoppable. MySpace was king. Facebook was now public. Music had gone digital. MP3 players and iPods took the place of CD players. Most people owned digital cameras which would lead to Kodak claiming bankruptcy by 2013. These massive changes set the stage for infection. The world change and the environment was altered forever. New parasitic organisms began populating. Blogs had been around for quite some time, but Ariana Huffington co-founded the Huffington Post in 2005, and while initially it attracted A-List contributors, it soon opened it’s doors to bloggers willing to trade “exposure” for content. Big sites like Huffington marked a major shift in how regular people consumed news and gathered information. Before, free stuff generally had a far lower quality, so we were willing to PAY. But now that the free stuff was almost as good, as good or better than the paid stuff? Come on. A no-brainer. Instead of paying for a newspaper or magazine, we went on-line. “Real” journalists were paid and this was a genuine constraint for news outlets and magazines competing with Huffington and a legion of “volunteers” offering excellent content. Huffington, like a regular print source still made money on ads, but unlike the competition (print sources) they didn’t have to worry about paying salaries, benefits or health insurance to most of their workforce. That was a dangerous precedent. A once a homeostatic environment where artists could thrive suddenly became toxic and vulnerable to disease. Original image via Flickr Creative Commons, courtesy of Stoere Schrijfster. First, with file-sharing, downloads and sites with free streaming music, consumers got in a habit of getting what they wanted for free. In 2012, Emily White published a blog on NPR I Never Owned Any Music to Begin With and revealed how she had a personal collection of over 11,000 songs and yet had only ever bought 15 CDs and how she was profoundly conflicted with the new reality of our world. Self-published authors flocked to Amazon and people like John Locke pioneered the idea of the .99 cent book and giving books for free. A tsunami of amateurs then rushed to publish unedited, often unreadable books. Countless “authors” flooded the market with content that used to be left to die in a slush pile. Yes, I love self-publishing and some of the best books of our time are coming out of it (Wool & The Martian) but the rush of amateurs who vastly outnumber professionals has had terrible consequences for consumers and artists. Amazon is now having to enact warnings on e-books regarding quality issues (to flag readers for spelling problems, poor editing, bad formatting) because too many amateurs were (are) offering up content that’s not ready for consumption. If uncooked chicken can make you sick, a book that’s not “done” can too. Those who sell hardware (tools) and access to the artists? They’re doing very, very well. Internet connection, devices, service, data streaming and conference tickets all cost consumers money. But what’s happening is those businesses and entities who deliver content (Amazon, iTunes, iBooks, AT&T, Spotify etc.) are making record profits while artists are withering on the vine. The Future is Streaming—Poison or Potion? I feel the future of everything entertainment will be a streaming model. We already have streaming television, news, music, and movies. I predict books naturally will follow suit. Whether this is good or bad is irrelevant. I think it’s coming. Barnes & Noble is dying and physical point of sale locations for new books are getting rarer. This means even big legacy publishers potentially will be muscled into cooperating with a streaming model if they want to survive. If consumers are getting their books off a streaming model and not buying copies? Will anyone have a choice? If writers don’t want to part of the streaming model? Amazon, iBooks (or whoever is offering streaming books) won’t be greatly affected. The distributors of today don’t have skin in the game. In the old days, bookstores and publishers DIED if writers didn’t succeed. Record stores and producers DIED if musicians didn’t succeed. They couldn’t fall back on the billions they made selling gadgets, connectivity, services and camping equipment to stay solvent. Companies are offering streaming to help artists get in front of overwhelmed consumers. It’s been designed (in part) to combat the discoverability problem, but the streaming model currently is NOT structured beneficially for artists. One musician’s song was played over a million times on Pandora, yet he was paid less than $17 (less than selling a t-shirt). Oh, but how can you refuse? Streaming PAYS and you get exposure, you ungrateful hack. Create something people want and stop whining! And yes, it’s scary and frustrating, but us not wanting this tech evolution to happen won’t change it coming. Tower Records, Kodak, BlackBerry, and Blockbuster are all good examples of what happens when denial is the action plan. Image courtesy of Spirit-Fire via Flickr Creative Commons. Now that I’ve shown you how our world has changed and painted a rather bleak picture, I want to revisit the story I began with. Oprah a billionaire hosting a conference about reaching your dreams…using largely unpaid performers. Huffington selling for $300 million and growing increasingly valuable using unpaid work. Can it change? I think so, but it is largely up to those we idolize to help change attitudes and educate the public. Taylor Swift is an excellent example. Earlier this past year (2015) iTunes went to launch its new streaming music program, and the plan had been to offer three months for free for users trying the program. At first this seems awesome! Especially for me (Average Consumer). But then Taylor Swift stepped in and wrote a beautiful letter politely shaming Apple and put her money where her mouth was. She refused to allow her latest and hottest album to be used in Apple’s plan. What’s interesting is that a company worth over $650 billion didn’t truly think about the consequences to artists by expecting musicians to work for free for three months until Taylor Swift pointed it out. Did they overlook this because they are psychopathic jerks who stay up all night thinking of ways to crush artists? Or, has this notion of exposure made businesses (possibly unintentionally) predatory? Doesn’t hurt to give the benefit of the doubt. That was the point of me offering up that history lesson. In the 1990s, a used bookstore greatly benefited writers because exposure actually did translate into PAID work. The same for doing spec work for Huffington or performing for free alongside Oprah. I know I’ve even offered my comparably microscopic platform to help unknowns gain exposure because exposure is still extraordinarily important. The problem however is that we need to make the next shift in the digital evolution. The biggest companies and names need to make it. Consumers need to make it. What we did to prime Web 2.0 cannot sustain it. What happens when everyone views exposure as just as good as cold hard cash (which WAS the case but is no longer the case) is that then all content contributors are working for free. When everyone is exposed then no one is. When everyone is paid with exposure then no one is paid. When conferences and corporations create space in the budget to pay everyone but those providing the content? That’s worrisome. It’s especially worrisome when exposure in these places is no longer leading to paid work. Why? Because it is only leading to people wanting to pay content producers with even more exposure. The fundamental shift in principals and morality is about who gets to control and exploit the work of an artist…Now we are being asked to undo this not because we think this is a bad or unfair way to compensate artists but simply because it is technologically possible for corporations or individuals to exploit artists’ work without their permission on a massive scale and globally. What I would add to this is that they can do this with the consent and support of the public who’s not understanding how their updated habits combined with outdated attitudes are killing the artists they love. I think why all this is bothering me so much is I feel like we’ve created a system where to survive, content contributors are literally the problem. We’ve become a cannibalistic organism. …but it can be cured. If FREE is a cancer, then WE are the T-Cells. All of us. Apple proves things can change. After Taylor Swift’s letter, the company deeply apologized and made it right. They paid the musicians and you know what? Everyone made MORE. Consumers felt better about signing up for Apple’s streaming because it was caring for artists and the artists were paid. Artists were happy, Apple was happy and consumers were happy. What if more BIG names were as protective as Taylor Swift? What if more SMALL names were is brave as Revolva? What if more ICONS were as fearless as Wil Wheaton? What if more CORPORATIONS changed their treatment of artists like Apple? What if consumers changed buying habits (refer to my post Fair Trade Fiction)? What if more conferences became active and creative to find ways to support the contributors? Perhaps a commission off ads sold, ticket sales, digital tip jars or even corporate sponsorships? What if more artists joined with the ranks of Coldplay, Taylor Swift, Adele, Beyonce and others and stood up for an ethical and sustainable internet (as these artists did with Spotify)? What if BIG name writers supported new writers like these mega-artists are doing in music? Just like Phillip Pullman who resigned as an Oxford literary patron over lack of pay for authors? What if more on-line magazines worked WITH bloggers like BuzzFeed who pays contributors based on click rate? For instance, instead of ALL my best content being on my blog, magazines can recruit us as talent. I’m happy WD Magazine gave me an award, now let me help YOU! Figure out a way we can both win. Old Guard + New Guard = NEW AND WAY BETTER GUARD! We are not alone! All of us in one way or another need to set an example and lead the way to the next evolution of the web. Web 3.0—A Better Place to Play, Live and Work. Image a gift to Flickr Commons from professional photographer Brett Jordan. Revolva had a fantastic idea, that I hadn’t seen in action. She had a TIP jar on her site and I left her a tip for using her story (Note to Self: Add Tip Jar to New Website). I know Flickr allows me to donate for the commons images, but I would LOVE a tip feature so I can support the actual photographers and image creators. I don’t have all the answers, but I do know that we have to work together to help consumers and businesses update their thinking regarding commerce. What are some ways we can change the world? What are some companies, conferences, businesses or artists that you’ve seen doing great things? How are they solving this problem? What are ways you think we might be able to work together instead of fracturing into a million pieces of Every Man Out For Himself? Have you been frustrated with this increasing expectation that you need to not only give for free, but it has to be as high of quality as paid work…and people just seem to want more and more and MORE? What are your thoughts? Experiences? Opinions? Concerns? Ideas? I love hearing from you. You guys are some of the most brilliant people I know and if anyone can fix this? WRITERS CAN. We have changed the world time and time and time again. Let’s roll! After posting this, I talked with Revolva and even though her blog got over a million views? Oprah’s people never issued a statement, wrote a letter or even offered apology. There is no indication of any policy change. The BIG players CAN and WILL LISTEN. APPLE DID! ARTIST EXPLOITATION IS RAMPANT IN ALL THE ARTS. MUSICIANS, ACTORS, CRAFTERS, WRITERS AND ON AND ON. IT HAS TO STOP AND I THINK IT WILL TAKE WRITERS TO DO IT. I am asking you guys to activate YOUR platforms. ALL OF US BLOG ON THIS. REPOST THIS BLOG OR EVEN REPOST REVOLVA’S. WRITE YOUR OWN THOUGHTS ON THIS AND LINK TO THIS POST. I AM BUILDING A NEW WEBSITE AND I WILL INCLUDE A PLACE TO LINK TO ALL YOUR BLOGS ON THIS TOPIC PERMANENTLY. It’s one thing to step on a performer, but REVOLVA doesn’t have a legion of TICKED OFF WRITERS on hand, whereas I DO. YOU can help me make a difference for ALL the arts! ***A special note of thanks to all the photos generously shared for free use. I donated money on your behalf. 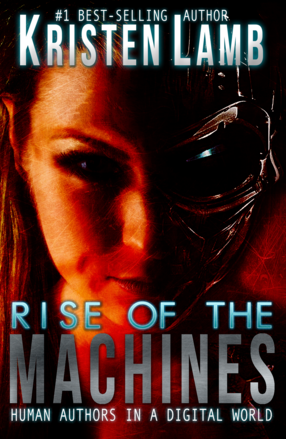 I don’t yet have a tip jar (redoing my web site), but if you like my work, please pick up a copy of Rise of the Machines—Human Authors in a Digital World on AMAZON, iBooks, or Nook.